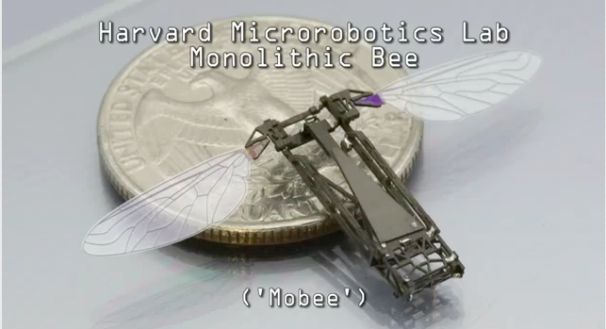 Let's say you want to build a swarm of inch-long flying robots. (Maybe you've got a DARPA grant. Maybe it's an art project—-imagine if those moved.) Flying is complicated and requires a lot of mechanical linkages and electrical connections. You can machine and assemble one robot by hand, under a microscope, with tweezers and a scalpel; it's a literal pain in the neck, but it's doable. But are you really going to do that for a hundred of them? A thousand? A million? Researchers at Harvard weren't, so they came up with a way to mass-produce their robots. To start with, they borrowed a trick from printed circuit microelectromechanical systems (PC-MEMS for short), the technology used in an accelerometer chip, for example (aka the thing inside your iPad that lets you use it as a lightsaber). Instead of cutting out parts from flat pieces of stock and then assembling them into the finished robot, the researchers used a laser cutter to cut the part design into the stock and then sandwiched the pieces together with adhesive. The researchers used different materials at different layers to create simple mechanical structures-—they used a layer of flexible plastic sandwiched between two layers of carbon fiber cut down the middle so the parts could move becomes a hinge, for example. From there, the researchers could apply solder to the metal pads designed to lock the pieces together, laser-cut the robot out of the surrounding material, and voila, they had a finished robot, ready for flight testing. This technique makes it easier to build many, many robots in parallel—-you're mostly limited by the size of your laser-cutter bed and your ability to line up the layers correctly when you sandwich them together. And researchers are starting to build tools to coordinate and program swarms of devices. With advances like these, it seems like the nanomachine future envisioned by K. Eric Drexler twenty-five years ago is moving ever closer. Will it all end in grey goo? Only time will tell. These devices will still probably be big enough to see for a while yet.